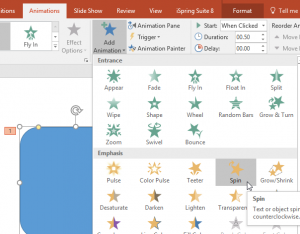 Many people use PowerPoint animation sparingly—probably to make text animate while showing up on a slide or even for column charts, where individual columns animate. 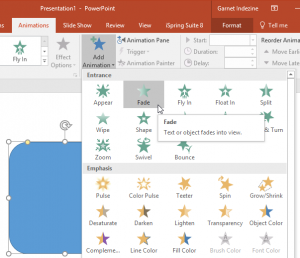 But did you know that you are not limited to the animation effects available in PowerPoint? You can actually combine one or more animations to happen at the same time for the same slide object, and thus create your own unique animation effect! Follow these steps to learn more. We used PowerPoint 2016 for Windows, but these techniques work in most versions of PowerPoint released over the last ten years. 1. Select any object on your slide such as a shape. 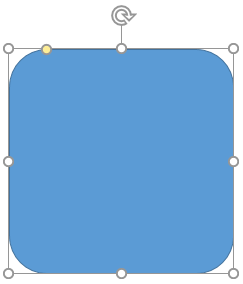 For our example, we selected a Rounded Rectangle shape, as shown in Figure 1, below. 2. Now add an animation to this shape. We added a basic Entrance animation called Fade (see Figure 2). 3. Now deselect the shape if you want. Then select the same shape again, and now add an Emphasis animation called Spin (see Figure 3). 4. Now play the slide. If you click once, the Fade animation will play. Click again and the Spin animation will play. 5. Wouldn’t it be better if both animations played together? Yes, this is possible—to do so, access the Animation Pane and set both animations to Start with the With Previous event (see Figure 4). 6. Now also change the Duration of both animations to match (see Figure 5). We showed you how you can make two animations play at the same time. You can similarly combine as many animations as you need. 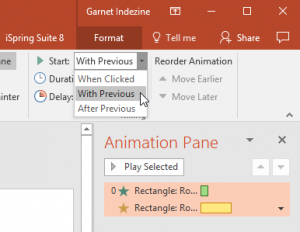 Tip: PowerPoint has four animation types: Entrance, Emphasis, Exit, and Motion Paths. You can combine any of these animation types but you cannot combine Entrance and Exit animations. Why? Well, that’s because you cannot enter and exit at the same time. He is an awarded Microsoft PowerPoint MVP (Most Valuable Professional) for over a decade now. He has been designing and training with PowerPoint for 15 years and heads Indezine, a presentation design studio and content development organization based out of Hyderabad, India. 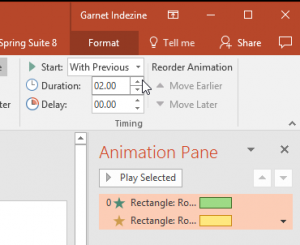 Geetesh believes that any PowerPoint presentation is a sum of its elements–these elements include abstract elements like concept, color, interactivity, and navigation–and also slide elements like shapes, graphics, charts, text, sound, video, and animation. He has authored six books on PowerPoint and trains corporate clients on how to plan, create, and deliver presentations. For more information on Indezine and Geetesh, click here.